As mentioned in one of my earlier blog posts, I migrated my OSS project from Apache Commons Logging and Log4j to Simple Logging Facade for Java and Logback. One piece however that was left open was my web logging component. It gives you access to your log files from within the administrative area of your web application. Not only can you download the current logfile, but you can also change the log levels at runtime. Just in case some of your app's users hit an issue and you can't SSH into the server that very moment but have web access - at least you can gain an overview of the situation quickly. The backend is implemented using Struts 2 but you should be just as simply be able to switch the code over to Spring MVC 2.5+. There was however a minor hiccup with posting collection data back to the server using JMesa. Only the latest trunk version (As of Nov 26, 2008) allows for getting the row count for each row, which is used to map the collection data back on the server. Anyway if you look for something similar for your own application, you can download all the relevant source code here. Please be aware that the archive is not a full demo application but rather a couple of source files cobbled together. If you rather like to see an entire buildable demo application, just let me know. I belong to the category of developers that used Prototype in the past. The funny thing is though that both libraries offer almost identical sets of functionality. You may ask why did I decide to go with jQuery? I like its innovative way of querying for page elements and to iterated over them, allowing you to often accomplish multiple tasks with just one line of code. jQuery in Action starts out explaining those core concepts of jQuery in the first 3 chapters of the book - allowing to query for page elements using the CSS syntax, how to manipulate page elements as well as how to work with collections of elements. The book does a very good job explaining those aspects of jQuery combined with many useful examples. What also drove me to jQuery was the fact that it has a plug-in mechanism that allows you to either use additional third party add-ons or to write your own plug-ins by still adhering to the spirit of jQuery. I guess this is a drawback writing a book about a subject that is evolving with the speed of light. Nevertheless, despite all my critical remarks, I think that jQuery in Action is an excellent book that will help you learn and understand jQuery. I certainly enjoyed reading the book. Today Keith Donald gave a presentation about Spring web application development at the Atlanta Java Users Group. It has been a great presentation. The room at the Holiday Inn was packed and people were actually standing in the back (At least 100+ attendees). The presentation covered overwhelmingly 2.5 features. I wish there had been more news about the upcoming 3.0 release. Nevertheless, I asked Keith when we can get our hands on Spring 3.0 M1 and he said it will be out before Thanksgiving on November 25. And the M2 release should follow one week later. Sweet. I wonder, especially with the 3.0 release, whether there is still any reason left to use Struts 2...but that's just my personal opinion. As Keith was getting close to the end, he only briefly talked about Spring Webflow 2.0 and Spring Faces. I wish Keith had mentioned a little bit more about the conversational state support that is supposed to be included in Spring MVC 3.0. In my current project we have the requirement to support multiple tab browsing for the same application. Thus, it would be nice to see how Spring is solving this requirement. Nevertheless, it has been a nice informative talk and also, Keith will be back in Atlanta March 10 and 11 for the AJUG sponsored developer conference at the Cobb Galleria. Can't wait to get my hands on Spring 3.0. The improvements for Spring MVC look very cool. Plus Keith Donald presenting at the Atlanta Java Users Group next Tuesday. Stay tuned for more information from that event. For my OSS project I went through the exercise of migrating from Apache Commons Logging (JCL) and Log4J to the Simple Logging Facade for Java (SLF4J) and Logback. 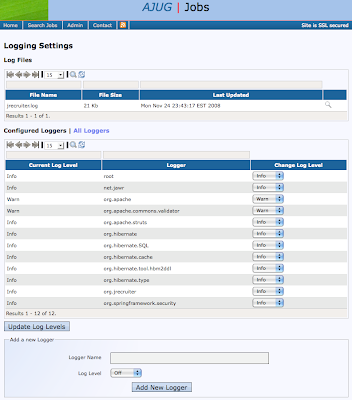 Logback is considered to be the successor of Log4J and is being developed by the same developer that originally developed Log4J. In return SL4J serves as a replacement for JCL. There are already quite a few projects that use SL4J including Hibernate, Mule and Jetty to name just a few. For converting your old log4j.properties file to logback's logback.xml equivalent, there is an online converter available. It worked quiet well, I had to do only one minor tweak for my config file. The nice thing about SLF4J is that it provides various components that help you bridge older logging libraries such as JCL and Log4J. Therefore, even your third-party libraries that don't support SLF4J and Logback directly will ultimately use them when using those bridging components. The result: No need to have Log4J of JCL in your classpath. Nice. The only potential headache is that if you are using Maven for your dependency management, then your direct dependencies often have transitive dependencies that include JCL. Well, you could manually exclude the JCL depency for each of your dependencies but what a pain, even when dealing with a moderately sized project. Luckily there is a workaround available: "commons-logging version 99.0-does-not-exist". It basically downloads a fake 0 byte JCL jar. Not necessarily pretty, but hey, it works as promised. Furthermore, I hit one more minor issue with the Jawr library: the current version is using Log4J directly. The developer of Jawr promised that in the near future they will migrate to....well...unfortunately not SL4J but rather JCL. Anyway, by using the log4j-over-slf4j bridge I was able to work around that issue, too. Well there is one task left for my project's logging framework conversion: I have a section in my web application that allows you accessing your loggers dynamically, which also permits you to adjust log levels dynamically at run-time. So far I was using Log4J directly to implement the necessary functionality...but that is worth another blog entry another time.